"This heavenly fruit salad tossed with homemade whipped cream came about when bananas, mangoes, and blueberries were on sale for Mother's Day, and I was already whipping cream for another dish. The entire bowl was demolished by 6 people! This combination would also work well with a variety of fruits added or substituted in, but I particularly like the unique flavor the mangoes add." Beat cream and vanilla extract in a bowl using an electric mixer until fluffy and stiff peaks form. Lift your beater or whisk straight up: the whipped cream will form sharp peaks. 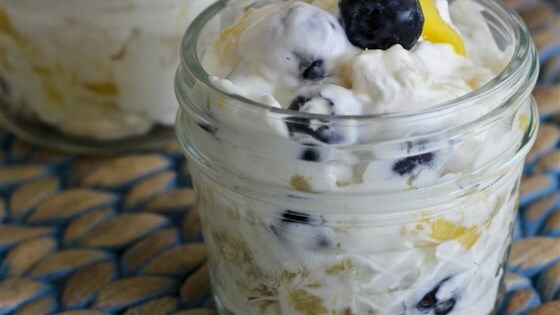 Fold mangoes, bananas, and blueberries into whipped cream. To pick out a ripe mango at the store, look for a fruit that has little or no green on the skin and is just a bit soft but not mushy.